Well, here we are in September after Labor Day, and that means Fall is just around the corner. And so will begin the season of endless fantastical Fall recipes that will have you packing on some serious pounds if you aren’t careful. But I’ve got some amazing Fall Weight Watchers Recipes that are SO good and yet still low in Points. I was in the kitchen this past weekend, getting my pumpkin on with a few new low calorie pumpkin recipes that I’ll be featuring this fall. 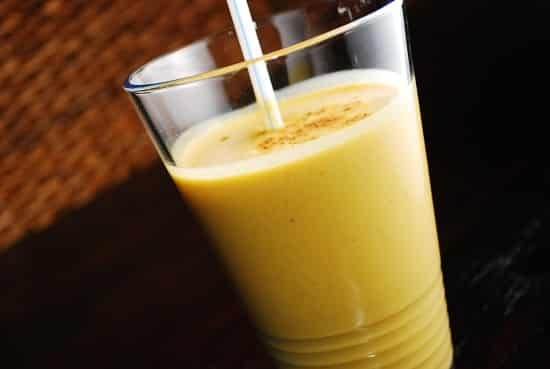 Even though it’s still summer, and still pretty hot, I thought I’d share a fall recipe — this amazing healthy, low Points Pumpkin Pie Smoothie Recipe. It’s made with ice, so it’s still a great way to beat the heat these last few weeks of summer while still enjoying some traditional fall flavors. This Pumpkin Smoothie is loaded with good for you ingredients, it’s rich, creamy, and filling, and has just 3 Points per serving. I really wish I had some fat free whipped cream on hand when I made this, because that definitely would’ve made it even more spectacular (and pretty! ), but I didn’t, so you won’t see it pictured up above, but I highly recommend adding it on. The whole smoothie recipe makes 2 servings, so it’s a very nicely sized smoothie. If you love pumpkin recipes, then this low calorie Pumpkin Pie Smoothie is a must try. An amazing low calorie pumpkin smoothie recipe that has all the traditional fall flavors you love but just 3 Points per serving. It’s the perfect fall drink recipe that is as healthy as it is delicious! Puree all ingredients in a blender until smooth. Serve immediately. I Tried this today for the first time . I used it for breakfast. It made 2.5 cups. I used 1.25 cups . Also, I used frozen bananas, instead of ice. It is difficult not to drink the entire batch. Thank you so much. Yes, but the protein will be lower, so just make sure you calculate the new nutritional stats to get the correct Points + total. I have made this smoothie over and over again. My kids love it and it is a great way to get some good fibre and protein into them! Thank you for sharing this! I have been doing weight watchers for 2 weeks now and this recipe has filled a gap! By the way, I ran out of bananas one day and used a Vanilla Banana flavored yogurt. Also, I’ve added honey when I have the points to spare. Ooooo…those sound like such yummy additions! I will have to choose soy milk instead; I’m allergic to almonds! Is there a sub for bananas?? What can be used as a sub for the unsweetened Almond breeze? You can use soy milk, or fat free milk, but you’ll have to re-calculate the Points +, as the nutritional stats will change.